Royal Voluntary Service, our charity of the year, has around 486 community centres, lunch clubs and social clubs. They offer a range of social activities and events that bring people together in varied and active ways. Community centres offer weekly programmes of activities covering arts and heritage, lifelong learning, healthy living and social events. The cafés that are often within the community centres are open to older visitors and the public for a coffee, chat and a bite to eat. Royal Voluntary Service lunch clubs bring older people together to enjoy a hot nutritious meal and socialise with friends at the same time. Lunch clubs typically meet once a month. The meal is just one part of the lunchtime experience. It's a social occasion as much as it is a nutritional one. 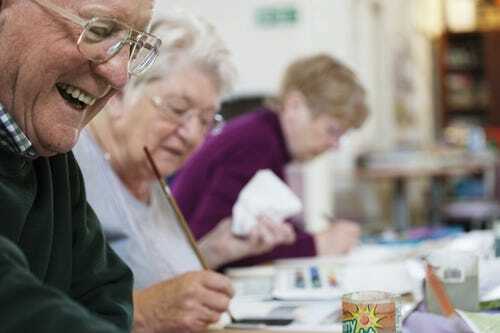 Social centres come in all shapes and sizes and often provide a mid-day meal as well as a wide range of activities from dancing, bingo and crafts to help with understanding pensions and benefits and filling in forms.